How Do You Win Back a Distracted Audience? It started out innocent enough. I just wanted to check out the acoustics in a workshop room I’ll be renting in August. The venue manager said there was a PUBLIC event Sunday. I could just slip in the back. So at 7pm I parked at Fort Mason; a converted military base, creatively re-imagined as a thriving arts and conference center—on the San Francisco waterfront. I took a seat as the room filled up with about 100 people. Suddenly I realized I was at an AA Meeting. Be Bright. Be Brief. Be Gone. Improv for business–coming out of San Francisco now–is in high demand. Working people are hungry for Improv’s high quality human connection. 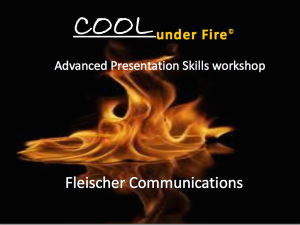 Improv-style workshops like Fleischer Communications jumpstart key soft skills: handling Q&A, holding your own on panels, winning back distracted audiences, doing interviews well or pitching up & down the food chain. 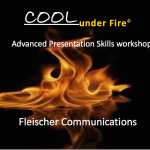 Fleischer workshops give people courage to handle rapid change—and hold their own.